Tasmin Little has been a leading light on the British and international music scene for close to two decades. Her flourishing career includes numerous television broadcasts and appearances at the BBC Proms and continues to take her to major orchestras in every continent around the world. Empowered by a vision to reach new audiences Tasmin launched a pioneering internet project in 2008, releasing an entire recital of solo violin works available for free download on her website. ‘The Naked Violin’ generated huge international interest, winning the prestigious 2008 Classic FM Gramophone Award for Audience Innovation. Partners in Time is a follow-up to this project — a disc of works for violin and piano illustrating the chronological development of the relationship between the two instruments and the ways that composers have fallen in love with, and responded to, this partnership. As in the case of ‘The Naked Violin’, Tasmin Little has recorded spoken introductions with musical illustrations, made available to all on her website, www.tasminlittle.org.uk. 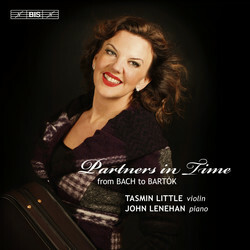 Tasmin’s website also includes a thank you gift to anyone who buys Partners in Time — a bonus track which can be accessed through the secret password printed only in the CD booklet. Tasmin’s partner on this journey through musical history is the eminent British pianist John Lenehan whose performances and recordings have been acclaimed throughout the world.